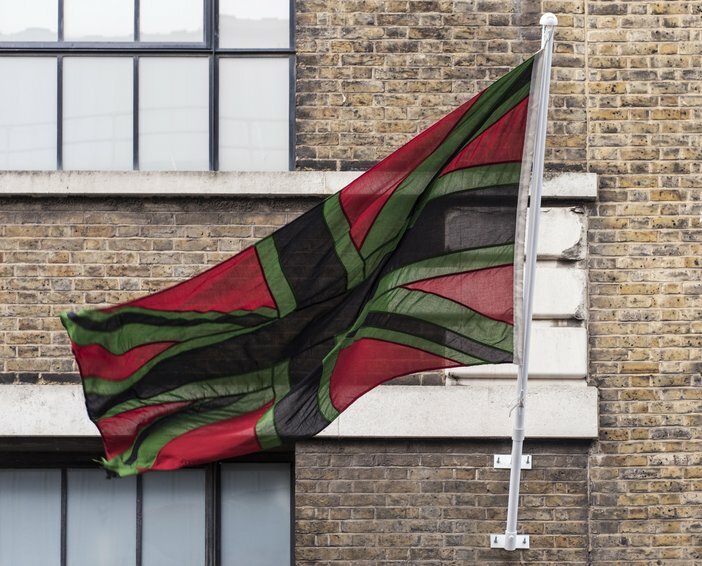 The work has been gifted to Tate by the artist and reimagines the iconic Union Jack flag in red, black and green. These colours derive from the Pan-African flag, representing African blood, Black skin and the continent’s abundant natural resources. It was a key addition to Ofili’s series of red, black and green paintings begun in 2000, which explore themes of Black love and liberation. The series was first displayed in the British Pavilion at the 50th Venice Biennale in 2003, where the artist collaborated with architect David Adjaye to create an immersive sensory experience focusing on these three colours. Three large and small versions of the flag were presented for the first time outside the pavilion. Union Black was last flown over Tate Britain during a major exhibition of the artist’s work in 2010. Ofili has often used materials and imagery inspired by Africa and the African diaspora such as elephant dung, characters from Blaxploitation films and hip hop music. Union Black is a continuation of the artist’s reflection on race and visibility. It introduces questions of identity and displacement, which Ofili has continued to explore since moving from London to Trinidad in 2005. Ofili is considered one of the most acclaimed British painters of his generation. Since his emergence in the mid-1990s he has built an international reputation for the visually rich and intellectually provocative nature of his work. During this time he has continually shifted his practice and confounded expectation, becoming the youngest artist to be awarded the Turner Prize in 1998. Ofili’s paintings have seduced viewers with their colour saturation and intricate ornamentation, bringing the Black experience to the centre of European painting tradition. Two of Ofili’s paintings, No Woman, No Cry 1998 and Blue Devils 2014 are currently on display at Tate Britain.